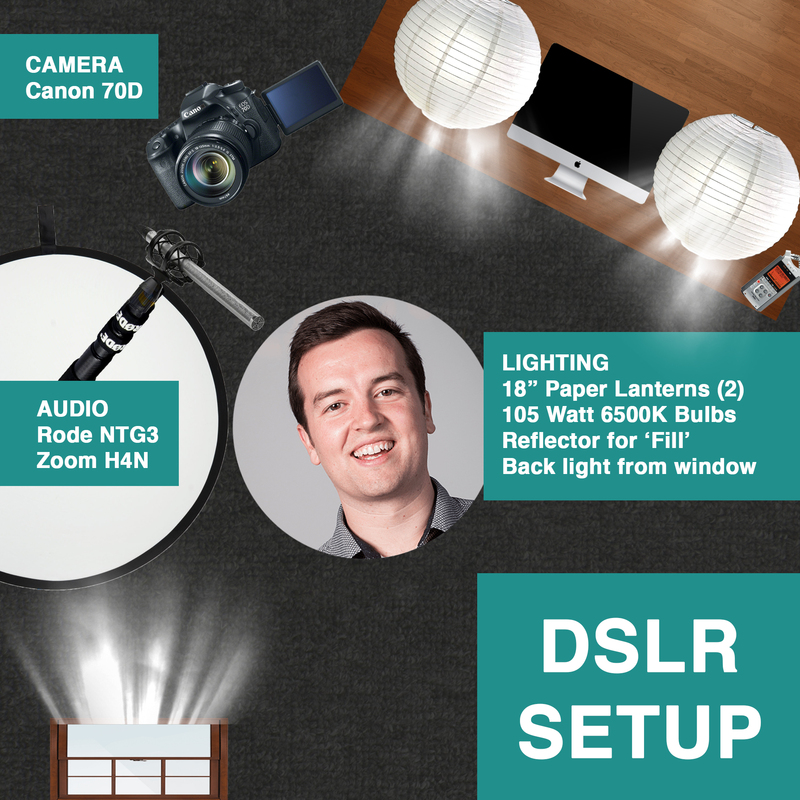 How do I set up my office when it is filming time? 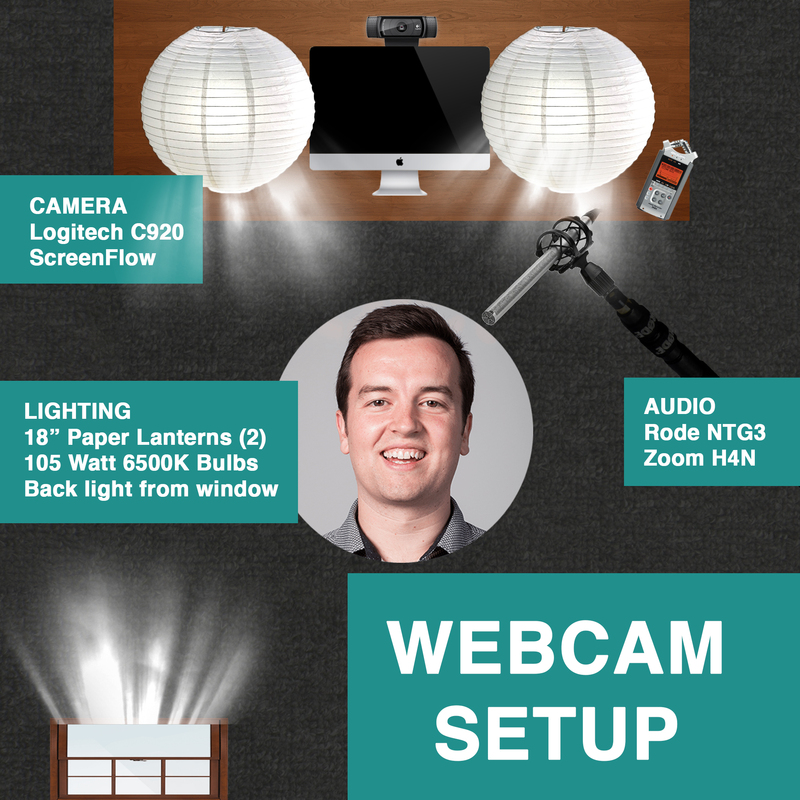 In this article, I’ll show you how I map out my video production setup for both webcam and DSLR videos. When do I use this setup? I shoot a ton of videos with my webcam including quick YouTube tutorials, podcast interviews over Skype, office hour videos with YouTube LIVE, and even some online course lectures. My Logitech C920 webcam is attached to the top of my iMac, which is on top of my Stand Up Desk (watch the review video). This desk also has my two 18″ paper lanterns with 105 watt 6500K fluorescent light bulbs inside (see how I installed my lights onto my desk permanently). This creates an ultra even lighting on my face, as I’m looking directly into the camera. A fair amount of back light shines through a small window at the back of my office, creating some separation from the backdrop. This of course changes depending on the day and weather, which I’m fine with. But it’s not completely controlled without putting up a curtain. For audio, I like to record with my Rode NTG3 shotgun microphone if I want super duper high quality audio. This is plugged into my Zoom H4N, and recorded straight into my computer via a USB cable (see how to turn your any mic into a USB mic with a Zoom H4N here). If I’m not using my Rode NTG3, I’ll be using my Heil PR40 for podcasting and screencast tutorials. But because this mic has a short pickup pattern (great for not picking up background noise, not great if you don’t want the mic in the shot), I either live with it in the shot or use the Rode. I shoot most of my talking head videos for my courses with this setup, and any high quality YouTube videos or promo videos. Because my desk can roll, the first thing I do is angle my desk to make room for a tripod and also get the lights close enough to where I’m sitting. I typically switch chairs from my computer desk chair to a stool so you can’t see the back. Sometimes I even stand up. I put my camera in the corner of the room and stand between 4-6 feet from it. I use a Canon 24-70 L-series lens and zoom in enough to get a good medium/close-up shot. This shoot is basically from my chest up with enough head room so my head isn’t getting cut off at the top. I try to use an f/4.0 aperture to get a shallow depth of field so my background is a little blurry. The key addition with lighting is a reflector disk that I position on the opposite side of me from the lights. This bounces back some of the light cast by the two paper lantern lights to even out the lighting on both sides of my face. With this setup, I do like having a bit more of a contrast (more light on one side of the face than the other). But I don’t want it to look like a dramatic interview. For audio, I typically always use the Rode NTG3 plugged into the Zoom H4N for this setup. Sometimes I record straight into the computer. Other times, I’ll just record into the Zoom recorder itself. In a pinch, I’ll just record straight into the camera with the Rode VideoMic Pro. And when I do this, I sometimes use my Canon 10-18mm lens so that I can get closer to the camera. Those are my two main setups that I use when I’m shooting videos in my office. I love having the flexibility of quickly shooting a video with my webcam setup, but also easily being able to setup my DSLR camera and get a completely different (and more professional) style with mostly the same equipment.